Originally developed in the medical industry, reagent test strips offer an easy, reliable method to test and measure conditions in soil and pond water. AccuGrow and AquaChek Pond Test strips feature a chemically impregnated pad that changes color within moments of being dipped into a sample. The resulting color is then compared to a color chart to determine the concentration of the chemical parameter. 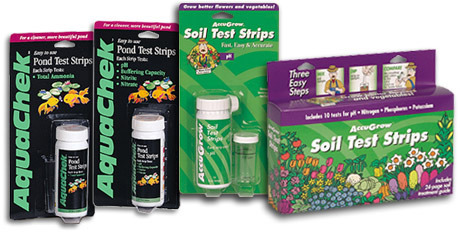 AccuGrow Soil Test Strips are your most important gardening tool. AquaChek Pond Test Strips help keep ponds clean and healthy.